What were the most pressing issues Indian CFOs wanted to talk about at the 9th Edition CFO Leadership Summit? Among the many topics, GST compliance is still a top concern. Indian CFOs and finance leaders gathered at the JW Marriott Mumbai Juhu on the 13th to meet and to talk about their concerns with colleagues and experts from across Indian corporate finance and industry sectors. The agenda was full of critically important topics, including debt financing relative to the Insolvency and Bankruptcy Code (IBC), cyber security, alternative forms of remittances like Bitcoin and, of course, GST. As an event sponsor, we had some of our own corporate spend management automation experts on hand. It was clear from the conversations they had with attendees that GST compliance and the burden it is putting on company operations is still very much a top concern. While deadlines have been pushed out due to the technical struggles the GSTN is having, what CFOs and other accounting and finance leaders told our experts is that the challenges they face internally are centered on data. This massive change in tax law and filing requirements is putting strains on organizations of every type and size, and much of it can be traced directly to availability of the data necessary to file returns promptly and correctly so that firms don’t overpay or underpay taxes. Attendees were keen to hear more about InvoiceAnywhere, our solution for automating corporate spend management. InvoiceAnywhere reduces operating costs by eliminating manual processes associated with vendor invoice management. As a cloud-based solution, it turns paper-based vendor invoices into digital invoices. It captures the tax data from each vendor invoice while it automates the entire invoice-to-PO matching, invoice review, and payment approval process. With InvoiceAnywhere, the tax data needed at filing time is a simple matter of running reports to extract the desired tax data. InvoiceAnywhere also comes with modules for generating and approving purchase requisitions and purchase orders so that the entire procure-to-pay process can be automated. 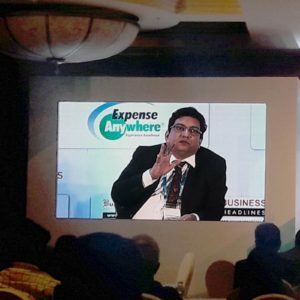 ExpenseAnywhere was proud to be a sponsor of the 9th Edition CFO Leadership Summit, and was glad to meet and talk with so many Indian corporate leaders. To learn more about us, visit us on the web at ExpenseAnywhere.com, and follow us on LinkedIn, Facebook, and Twitter.